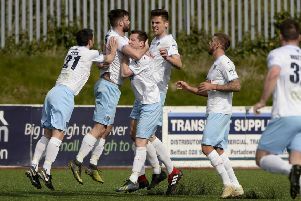 Wakehurst manager Ian Gregg was left to reflect on a disappointing day as his side lost 2-0 at Tobermore United in Saturday’s Belfast Telegraph Championship Two game. “It was a dour struggle on a hard, bumpy pitch and it wasn’t a great game, said Gregg. “We paid the price for not taking a number of chances, including Conor Gregg hitting the bar in a one-on-one with the keeper. Wakehurst’s misery was compounded when they finished the game with nine men. Firstly Conor Gregg was sent off for two bookings, the second for dissent towards the assistant referee. He was joined in the changing room by Andy Erwin who was sent off late on for what the referee interpreted as a ‘last man’ foul. Wakehurst: Maybin, Swan, Stevenson, Colville (sub Price), Erwin, Lemon (sub Parker), Laughlin, Crawford (sub Speirs), R Gregg, C Gregg, Foster.